Just like that, there are now 12 gubernatorial races on the docket for 2016 instead of the original 11: Oregon’s now ex-Gov. John Kitzhaber (D) announced on Friday that he would resign the governorship effective Wednesday, Feb. 18. Because the Beaver State has no lieutenant governor position, the next in line is the state’s secretary of state, new Gov. Kate Brown’s (D) former position. By law, Oregon will have a special election in 2016 (the next regularly-scheduled statewide election), adding it to the list of 2016 contests. Kitzhaber’s difficulties began prior to his reelection this past November to a state-record fourth term as governor. What started with questions about his fiancée Cylvia Hayes’ odd history grew into serious concerns that she had violated ethics rules or even criminal laws by using the position of first lady for personal gain. These inquiries grew to include Kitzhaber’s own activities. On Feb. 4, the state’s largest paper, The Oregonian, ran an editorial calling on him to resign, with a thorough review of the many questionable actions taken by the couple. Then on Feb. 9, the state attorney general announced that she had opened a public corruption investigation regarding Kitzhaber and Hayes. With pressure mounting, the governor asked Brown to return early from a conference of secretaries of state in Washington, DC. Once they met, things took a turn toward the peculiar. Kitzhaber asked Brown why she had come back early, stated that he was not resigning, and began talking about transition because his new term had just begun in January. A line from Brown’s statement about the situation summed things up: “This is clearly a bizarre and unprecedented situation.” A day after Brown’s statement, Kitzhaber announced his resignation. First elected as secretary of state in 2008, Brown was considered a top candidate for the 2018 gubernatorial race and had been angling for the office after a long career in Oregon politics. Her secretary of state tenure had a few warts, particularly her botched handling of the scheduling of a special election for state labor commissioner in 2012. That, among other reasons, led most major newspapers in the state to endorse her 2012 GOP opponent, but Brown won reelection comfortably. Nationally, Brown’s elevation to the governorship is notable in at least one way: She is the country’s first openly bisexual governor. Presumably, Brown will run in the 2016 special election, and following Kitzhaber’s resignation, we announced a rating of Likely Democratic to start for the 2016 race. Assuming she can get the Democratic gubernatorial nomination, Brown will start as the favorite in the contest because she’s a Democrat running in Oregon, a relatively blue state. Moreover, she will be running in a special election taking place at the same time as the presidential election. But take note of our assumption — that she is the Democratic nominee. Ambitious Democrats such as state Treasurer Ted Wheeler and state Labor Commissioner Brad Avakian are already hinting that they may challenge Brown in the primary. We’ll see — a great deal will obviously depend on the new governor’s performance in the highest office. Brown’s 2012 opponent for secretary of state, state Rep. Knute Buehler (R), is reportedly looking at the gubernatorial contest as well. Oregon is a reliably blue state that has not elected a Republican governor since 1982. It last voted for a Republican presidential nominee in 1984 during Ronald Reagan’s landslide reelection. However, the Beaver State nearly backed George W. Bush in 2000; Al Gore won the state by less than 7,000 votes, in part because of the candidacy of Ralph Nader. The Green Party nominee won 5% of the Oregon vote, his 10th-best state (including DC). 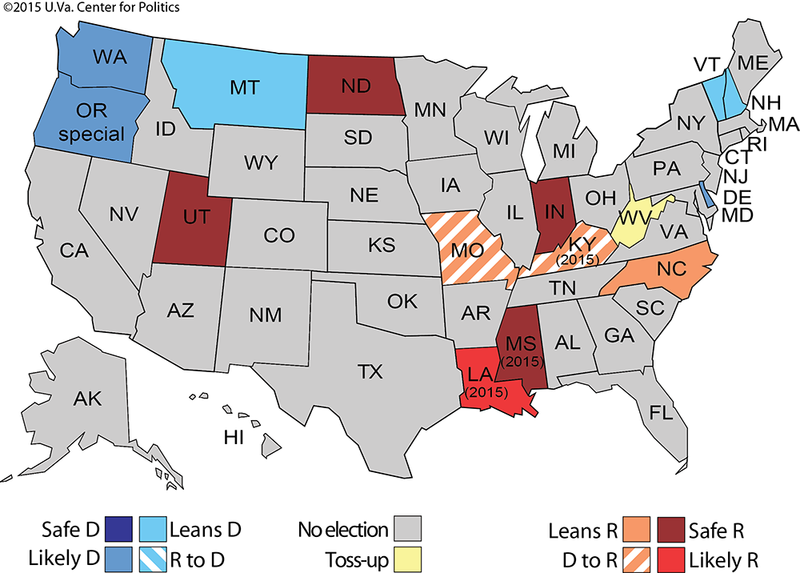 In 2012, only 13 states and DC were more Democratic than Oregon. Republicans would have needed a 6.3 point uniform shift in the two-party vote across the country to capture Oregon, and such a change would have resulted in Mitt Romney winning 359 electoral votes. The point is, the Democratic nominee for president in 2016 will be a good bet to win Oregon, and down-ticket Democrats like Brown or someone else should be expected to reap the coattail benefit.